A H8K Emily of 851 Kokutai, moments before it was shot down by a US Navy PB4Y. 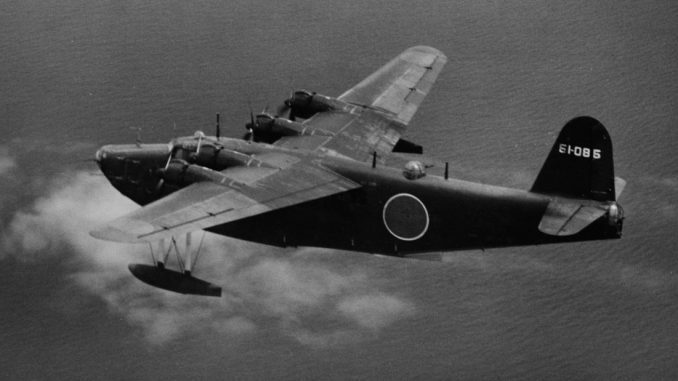 As soon as the Kawanishi H6K entered service, the Imperial Japanese Navy began the search for an improved flying boat to eventually supplant the Type 96. 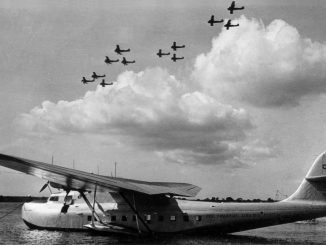 The 13-Shi specifications called for a new flying boat design with superior performance to the British Short Sunderland, which was then beginning to enter service with the RAF. The specifications included a desired range of 4,500 miles, with a maximum speed of 276mph. Firepower was also to be greatly improved over the H6K, with up to five 20mm cannon available for defence against enemy fighters. The H8K featured a high, cantilevered wing as opposed to the H6K’s gondola arrangement. Four powerful Mitsubishi Kinsei engines could drive the big bomber along at over 275mph, much faster than the older aircraft. The H8K could carry two torpedoes or up to 1.000kg of bombs. The initial prototypes struggled with poor on-water characteristics, with spray being thrown up into the engines. Changes to the design of the hull, which was deepened and given ‘steps’, soon rectified this problem. Unlike most Japanese aircraft, the H8K had self-sealing fuel tanks and it also had a recovery system that pumped fuel leaking from damaged tanks out of the bilges and into undamaged fuel tanks. Production models also reduced the number of 20mm cannon from five to two, with additional 7.7mm machine guns substituted in their place. The Type 2 entered service in spectacular fashion. The first combat operation for the big flying boat was ‘Operation K’, an attempt to bomb the repair works at the Pearl Harbor dockyards in March 1942. Two H8Ks set out from the Marshall Islands, refuelled from a submarine stationed in the French Frigate Shoals, and then headed for Oahu to drop their load of bombs. Bad weather meant that bombing results were very poor, but both planes made it safely back to base. The mission had covered 4,700 miles, an incredible feat regardless of the results. 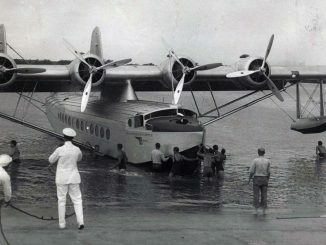 Thereafter H8Ks were assigned to flying boat units to serve alongside the older H6Ks, which remained in service until the end of the war. They carried out long-range maritime patrol missions, and were occasionally used for bombing missions against distant targets – several were used to bomb towns in Western Australia during 1943 and 1944. Aerial encounters between H8Ks and long range American aircraft like the PBM and PB4Y were common, with many examples of air combat ensuing. 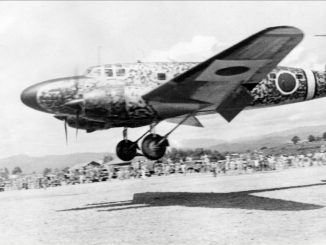 With it’s rugged construction and heavy defensive armament, the H8K was considered one of the most formidable Japanese aircraft to meet in combat. Later models were fitted with air-to-surface radar for anti-submarine patrol, and claimed responsibility for sinking several U.S. submarines. Kawanishi also developed a transport model, the H8K2-L, with extra seating internally – up to 64 troops could be carried. It was a H8K2-L that was carrying the commander of the Combined Fleet, Admiral Mineichi Koga, when it disappeared in March 1944. The aircraft had flown into a typhoon on a flight from the Palau Islands to Davao in the Philippines. In 1942 the H8K was assigned the reporting name ‘Emily’ by Allied intelligence.